What do you write on each page? How do you get people to buy from you or to get in touch? Each question brings up more questions. Each web page gives you a headache. Are you feeling tired yet? Do you want to give up your website project? Or delay it until next year? Creating a new website or updating an existing one can feel like a nightmare. 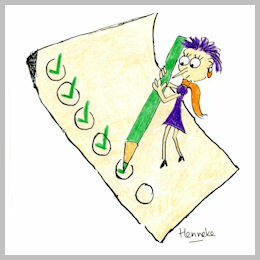 But your web project doesn’t have to be so difficult – as long as you have a simple checklist. Use the list below to avoid content failures and to create a website that’s both engaging and persuasive. Let’s start with your overall content plan. When we start a web project, most of us think about who we are, what’s special about us, and how we should communicate our unique selling points. But our readers aren’t interested in us, our business, and our products. Consider who you’re writing for – this is your ideal reader or buyer persona. Define what content helps your ideal reader understand your type of products or services – perhaps you need to educate your reader and explain what a marketing coach, web designer, or IT specialist can do for them. Collect the reader questions you should answer and consider how you can help your ideal reader make choices – your ideal reader might not know whether he needs a web designer or a web developer; or whether he should get a Windows or Linux server. Think about how you can help your ideal reader. Does he want to grow his business to make more money? Or would he prefer to find a way to work less and still make enough money? To start a conversation with your ideal reader and to sell to him, you need to understand what drives him, what motivates him, and what he’s dreaming off. List the objections you need to overcome. Why would your ideal reader hesitate to hire an interior designer or business coach? How can you nudge him and overcome his hesitations? Web visitors are in a hurry. They don’t read word by word. On an average web page visitors read only 28% of words. As their cursor already hovers over the back button, how can you quickly tell web visitors what they’ll find on your site? Confirm that people are in the right place. Avoid a clever headline As usability expert Steve Krug suggests: Don’t make me think. Don’t waste precious pixels with a headline like Welcome at Enchanting Marketing. Have a clear call-to-action. What are people supposed to do on your home page? Don’t push your services but focus on what your web visitors want to do. For instance: When the Swedish Cancer Society shifted focus away from organizational goals (more donations) towards web visitor goals (understanding cancer symptoms and treatment), donations increased massively (source). Minimize distractions so web visitors can quickly find what they’re looking for. Avoid self-indulgent blurb that nobody is interested in. Who wants to read company news on your home page? Include an interesting image. Make a product photo clickable so people can find further information on the featured product. It’s about your company. Your history. Your products. Maybe some stuff about you personally. That’s it. Isn’t it? That shouldn’t be the main focus. Potential customers don’t want to listen to your stories all the time. What they want to know is: What’s in it for me? Remember to address your reader with the word you. Include some interesting tidbits about yourself, but avoid self-indulgent content. Ensure that your about page reflects the right tone of voice. If you’d be talking to a client on the phone, would you sound the same? Include a photo of yourself or your team. People connect with people and we like seeing faces. Don’t forget a call-to-action. An about page is often one of the most visited pages. What would you like web visitors to do next? Include a sign up form to your newsletter or links to your service pages. Don’t expect web visitors to figure out what to do next. Be bossy and tell them what to do. How often do you come across a boring contact page with just a drab web form? Perhaps the contact page is the most neglected page on the web. Often it chases visitors away rather than encouraging them to email you or pick up the phone. Show you’re interested in hearing from someone with a friendly introduction. Suggest how long it’ll take for you to answer inquiries. Don’t make a web form your only method of contact because it’s impersonal and robotic. Add a phone number or at least an email address (use [at] instead of @ to avoid spam). Include social media profiles and encourage people to connect – but don’t include profiles that you haven’t updated for the last year because it looks like you’re out of touch. If you have a physical address, include your full address, a picture of your building, a geo site map (so people can find you in Google Earth and on Google Maps), driving directions, and details about parking. If you have a showroom, include details of what people will find in your showroom as an incentive to come and see you. Even experienced web writers make it sometimes. They simply describe what you do, rather than persuade readers to contact you or buy from you. Think about your ideal reader and how your product or service helps him. Create separate pages for each service you offer because this will help you generate more search engine traffic. Use the same language your clients use. If they’re looking for a marketing coach, don’t talk about a business optimization service. Focus on benefits rather than features. Features are facts about your product or service. Benefits explain what your product does for your clients. How do you help clients achieve their objectives? How do you take away hassle and problems? Don’t forget a clear call-to-action – get people to buy your product, to contact you, or suggest where they can find more detailed information. People are tired of sales pitches. They’re looking for information that’s helpful, entertaining, or inspirational. You don’t need to blog daily or even weekly. Create website section where you share helpful advice because it attracts visitors to your site, and it builds trust and authority. Stop worrying about word count. Communicate your message in the number of words required. Publish content only when you have something to say. Publish content you’re proud of. Don’t worry about giving information away for free. As Chris Garrett recently said: I have yet to find someone who has given away too much. Create a newsletter sign up form that stands out and encourage people to sign up by telling them what they can learn and how you can make them feel better. Editing doesn’t mean you simply correct grammar and spelling mistakes. Check the flow of your content. Ensure you’ve not missed anything important. Consider the people sneaking in through the back door – not everyone lands on your home page. Can they navigate their way around when they land on a blog post or a product page? Ensure your spelling and capitalization is consistent. For instance: Subheads Can Use Title Case Like This. Or subheads can use sentence case like this. Both methods are fine as long as you’re consistent. Use non-sugary testimonials to overcome customer objections. Don’t limit your testimonials to a dedicated page – include them on your home or about page, and on your product pages. Include a call-to-action on each page. What do you expect your readers to do next? Challenge yourself to reduce your word count by half. Simplify your text, kill redundant sentences, and slaughter excess words until you get your message across in as few words as possible. Remove exclamation marks, because they’re the sign of a lazy copywriter or a sleazy sales man. Avoid the passive voice because it sounds awfully corporate. A mistake has been made is passive and dull; I’ve made a mistake is active and engaging. Reduce your sentence length to a maximum of 14 words on average because it makes your content easier to read. Use plain English. Avoid superlatives and banned words like market leading and world class, because they make you sound sleazy. You know I’m a rebel. Position your logo at the top or top left, because that’s where people look to find out who you are. Include a navigation bar at the top or the left-hand side – on each page. Make clickable buttons look like buttons, because people know they can click buttons. Avoid creative wording – keep it simple. Why would you make it difficult to read? Don’t make your lines longer than 75 characters. Longer lines are difficult to read as you need to move your head like you’re watching a tennis match. A shorter line length becomes stressful as your eyes have to move back to the beginning too often. Increase your font size. Don’t make your readers strain their eyes with a tiny font. Have plenty of white space because blocks of texts are tiring to read and turn readers away. Your text is left-aligned because our eyes automatically return to the starting point when we’ve finished reading a line – just like in books. Use dark fonts on a light background for maximum contrast. Make headlines stand out in a larger font in a different color. Use bullet points to make your content easy to scan. Firstly you write for your ideal reader. Include a title tag with a maximum of 55 characters. Your title tag becomes the blue link in search results, so it’s important that it tells readers what your page is about. Use active words in your meta description to encourage readers to click through. The meta description is the text shown in the search results below your URL and a maximum of 155 characters is recommended. Use H1 tags for headlines and H2 tags for subheadings. The H1 and H2 tags indicate to Google that these words are more important than the remainder of your text. Be specific and answer customer questions, because it increases your chances of gaining relevant web traffic. Get Google Analytics set up so you can measure your results and find what content is most popular. In your site footer, replace the standard links to your theme with a copyright statement. Include a privacy statement to explain what data you’re collecting. Always start with your ideal reader. View your website through his eyes. Overcome his objections and nudge him in the right direction. Allow him to achieve his aims. Help him fulfill his dreams. Be yourself. Be enchanting. And business will come. Very soothing and reassuring. Thanks, Henneke! Henneke, I am starting to get worried here! Soon you will have covered EVERY subject, and then what? Not only do you deliver, you deliver with passion. I love, and will use all 61 points. Thanks for putting this awesome resource together, Henneke! Downloaded the PDF; I’ll have to work my way through the list. I especially liked what you said about not breaking web conventions. Sites that do that might have good intentions (expressing their unique personality or something like that), but it always annoys me when I can’t find something as simple as a navigation bar! And yep, I agree, sometimes creativity is taken too far. I in the process of switching to a new theme for my website so will definitely be able to apply these tips as the project progresses. Thanks for organizing this into a digestible format. Good luck with the changes to the website! Will you send me a link once it’s ready? I’d love to see it. Wonderful, useful, and delightful…but what else have I come to expect from you, Henneke? Thank you so much! Great list. I’ve just implemented #7 the Welcome Page. I got rid of “Welcome to….” and replaced it with, “You want to take better pictures”. I still have lots of tweaks to do. The tweaking never stops. I still have lots of tweaks to do as well. We’ll get there step by step! Wow, Hanneke, you aced it again! Another exquisite piece of work. What I love most is the fact that you gave us the list to download in PDF, very helpful to start at a point and work through them one by one. Looking forward to seeing your next post. Even though it might not be such a long post, (like you said to Lori) still love your work, you enchant us. Yep, that’s exactly why I created the PDF. Much easier to save & print; and then go through bit by bit. Very thorough, informative and easy to read Henneke. Excellent to be able to download your points in a pdf. Well done. This is a very useful post. I encourage people to check their readability score in the Gunning Fog Index or a similar measure of readability . They are often really surprised at how hard their copy is for ordinary people to read. Yes, that’s a good point, Rie. Readability is extremely important. Hi Abdul – Thank you for letting me know about the leadbox. When I test it here, it’s working. What’s going wrong for you? I’ll email you the PDF. Thanks for putting this awesome resource together! I downloaded the PDF and have put it next to my computer to start working through the list. I keep coming back to your posts, over and over, for solid actionable help. Today I’m working my way down the 61-points. Tweaking and improving where I can. I’m interested in the tip on creating meta-tags. Do you have any more posts on this topic? I think this idea would apply to alt-tags for Pinterest descriptions too. Very useful guidelines to a non-technical beginner like me. I’m glad you enjoyed the checklist! Henneke, I have been loving everything you’re doing since discovering your work in recent months. So great. Inspiring. Thanks for that. My question is about personas. I have 1-2 clear, ideal readers, who I have developed. I’m trying to get specific as I write by thinking of either one of them as I go. But there are also two other personas who keep tapping me on the shoulder. But I’m worried that four might be too many. What do you think? Should I stick with 2 or allow 4? If I write to each one individually all the time, will my material be cohesive and appealing or will persona #1 get annoyed? It depends on how different the problems are that each of the ideal readers is struggling with (and that you help solve through your blog). If the problems are similar, they’d probably like to read all your posts. But if you have 4 distinct personas and they’re not interested in the same things, then you’d be emailing them blog posts and they want to read only 1 in 4, making it hard to build a relationship with them. Plus, to avoid sending them a lot of articles they’re not interested in, you’d have to segment your list.